MPs Approve Shs1.3trillion Loan To Build Lubowa Hospital. 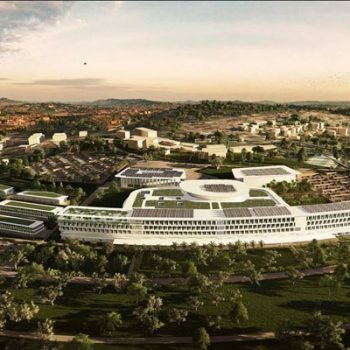 Parliament Tuesday approved a Shs1.3 trillion (about $379.7m) loan to a private investor to finance the construction of a specialised hospital in Lubowa, Wakiso District. The specialised hospital, which will be constructed under a joint partnership between FINASI/ROKO Construction Limited, will focus on the treatment of Non-Communicable Diseases (NCDs) that have been forcing Ugandans to seek expensive treatment abroad. According to the 2016 Auditor General’s report, 154 patients were cleared for treatment abroad in a period of three financial years at an estimated cost of $ 2,837,909 excluding flight, upkeep and attendants’ costs. The cost of medical treatment abroad was the main argument that State Minister for Finance (Planning) David Bahati made in support of the loan request. Approval of the loan was, however, preceded by controversy as a Minority Report authored by Busongora North MP William Nzoghu, Ayivu County MP Bernard Atiku and Mukono Municipality MP Betty Nambooze raised red flags over the legality and economic viability of the loan request. The Minority Report warned that approval of the loan violates the Public Finance Management Act because the government signed contracts with FINASI without parliamentary approval, questioned the procuring of FINASI/ROKO as the investor for the project and also pointed out that there inconsistencies in the cost of financing of the hospital. “According to documents submitted by the Ministry of Finance, the total project cost breakdown is $ 249.9m with no tax payment component. However, the financing for which government is seeking Parliamentary approval is $379.7m thus on increment of $ 129.83 million, which is 52% of the original estimated cost,” the report indicates. Butambala County MP Muwanga Kivumbi said there are other priority areas in the health sector that have to first be addressed. “It is unpatriotic to approve the requested promissory notes,” Mr Kivumbi said. The Minority Report also pointed out the dispute over the ownership of the project land and the lack of clarity on the operation of the specialised hospital alongside other specialised facilities in the country as reasons why the loan request should not be approved. “Now that the said land is the subject of dispute and its legal status is still unresolved, we risk litigation and might be forced to forfeit the investment thereon altogether,” the Minority report warned. Lands Minister Betty Amongi countered that disputes over the hospital land were resolved in court and that the land is now free from any encumbrances. To counter the arguments made in the Minority Report, Health Committee Chairman Michael Bukenya presented statistics from the India High Commission indicating that between 2015 and 2016, some 3,200 Ugandans sought media visas to the country for treatment. Mr Bukenya told the House that about 5000 Ugandans travel to India for treatment outside the medical board. “Each Ugandan going to India goes with at least $25,000 to $30, 000, excluding transport and the person accompanying them. This is about Shs200b per year for India alone without considering those who go to Kenya and South Africa,” Mr Bukenya said. Speaker Rebecca Kadaga read a letter by President Museveni supporting the request to approve funds for the International Specialised Hospital (ISHU) . According to the Main report of the Committee on National Economy, the proposed hospital will comprise of a 264-bed specialized Healthcare Facility with an 80-bed oncology centre, in addition to Doctors and Nurses school and accommodation.